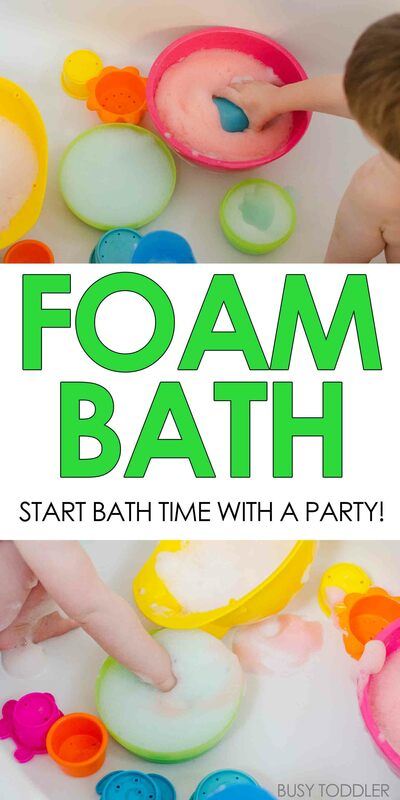 Have a crazy fun time doing a Foam Bath! Making bath time fun is one of my goals in life. I know most people strive for personal happiness or career success or total peace, but I’m pretty sure I’ll take happy bath times over all of that (wink). My latest gimmick: start it as a Foam Bath. 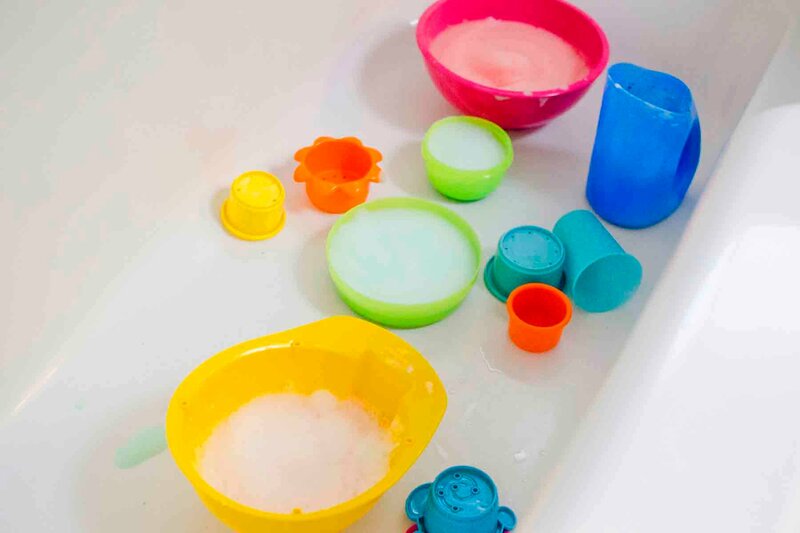 If you are into happy bath times too, check out some of my other bath time ideas: Lego bath, Gak bath, and Snow Tub. Setting up a Foam Bath is super easy. Making foam is seriously a snap. It’s a 2 to 1 ratio of water to bubble bath. I usually go with 1/4 cup water + 2 T of bubble bath. I add a few drops of food coloring to make it special. Then comes the hand mixer: You want to mix this in a pretty good sized bowl and whip it on high until “stiff peaks” form. If you’ve ever made whipping cream, it’s a similar process. I poured each color I made into a bath tub approved bowl aka anything plastic I had lying around. Yes, that is a construction hat I made one batch in. Judgy wudgy was a bear and also a mom who ran out of bowls. My kids love starting baths this way. 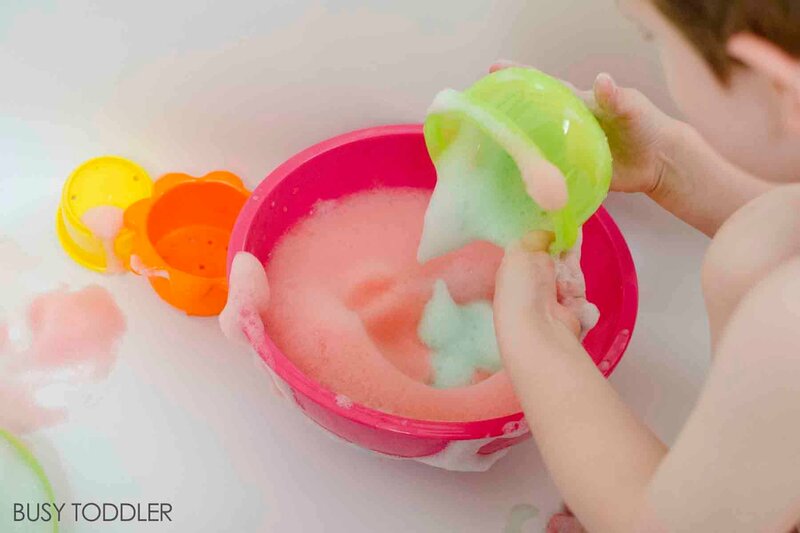 They (3 yrs old & 17 months old) scoop, pour and swirl that foam for ages. The foam lasts about 10 minutes and that’s plenty of time to get the bath party started. Once they are ready, I turn on the water and the colors / foam make the bath a rainbow-bubble explosion. It’s pretty rad. There’s nothing better than a happy bath time and Foam Bath has been a life saver for me lately. 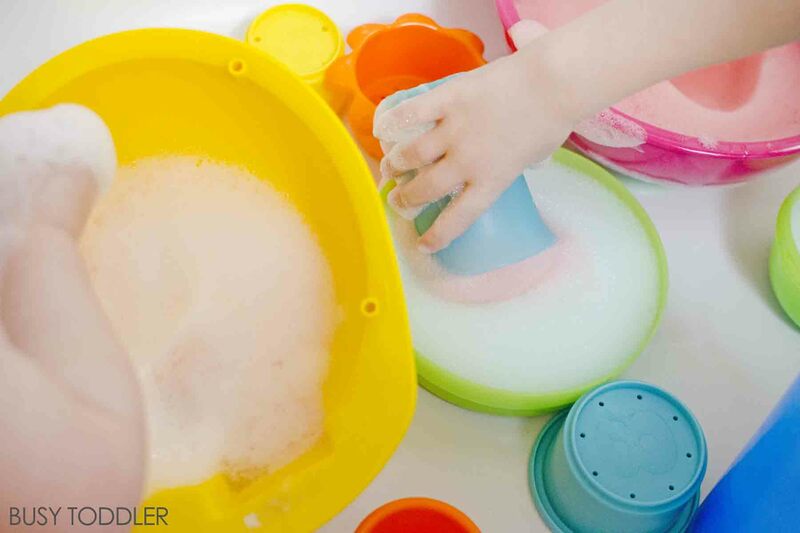 It starts the bath off with so much fun and happiness, and makes the whole experience a great activity for my kids. Foam Bath has become a weekly party in our house. 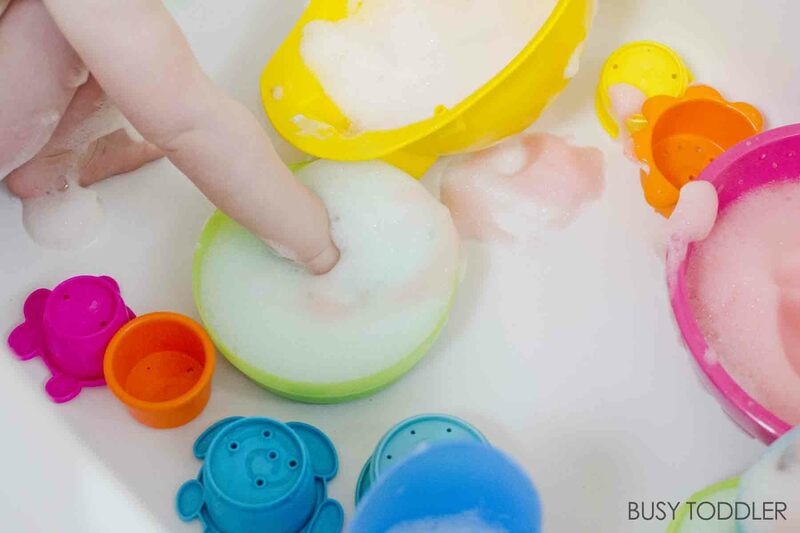 What would your kids think of Foam Bath? This looks so fun! 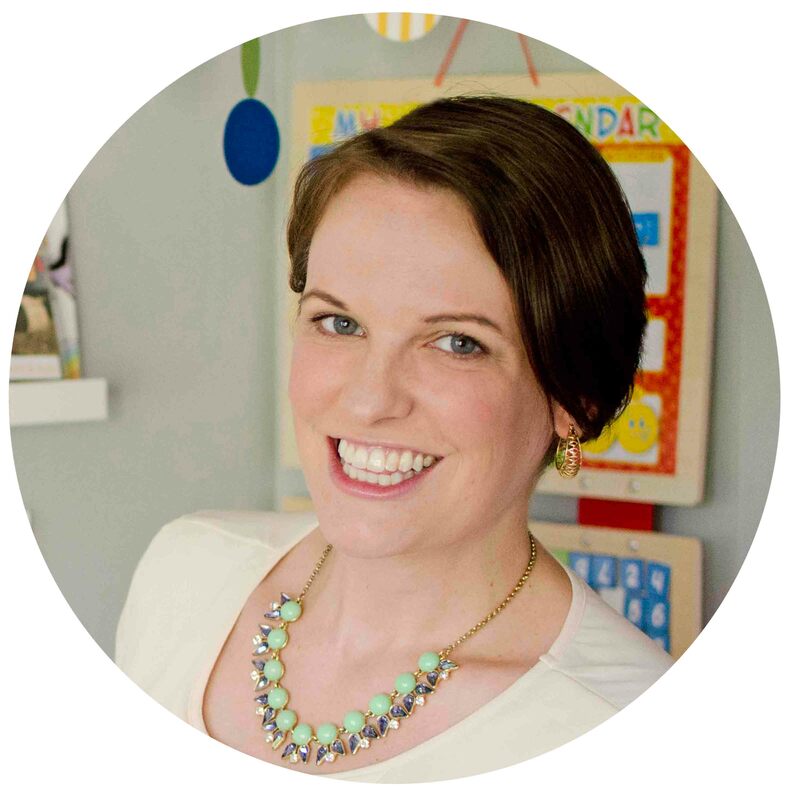 I seriously love all of your posts and I pin almost every single one! 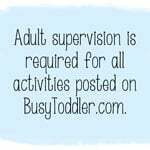 You are a toddler genius! 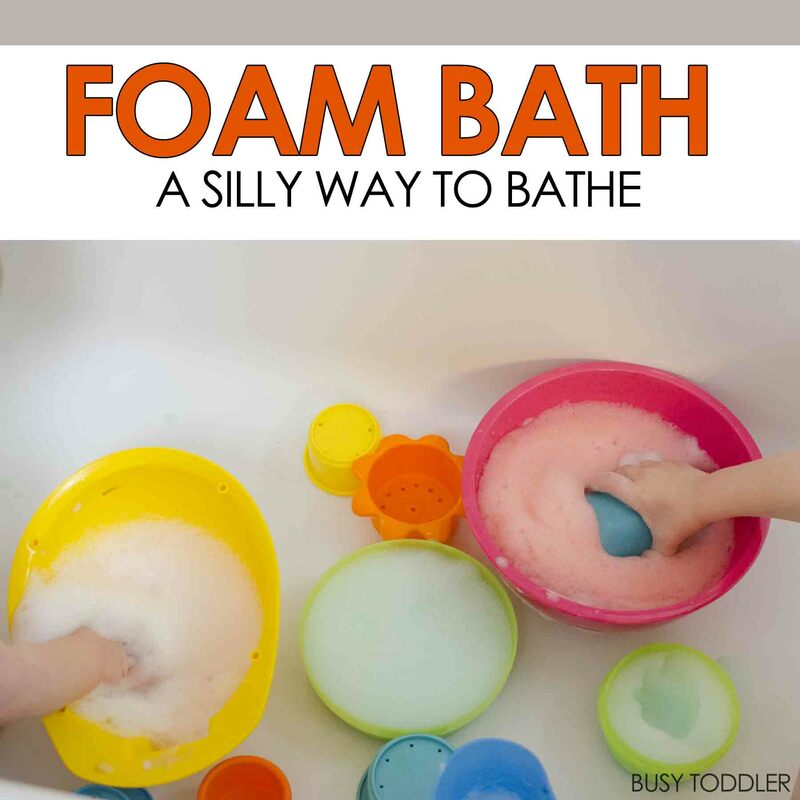 Then I guess I’m getting Foam Bath for my kids… They’d love it..